Dhaka, Dec 10 (Just News): Moderate rainfall, caused by the influence of deep depression which weakened into depression in the Bay of Bengal, disrupted the normal life in the city on Sunday morning. 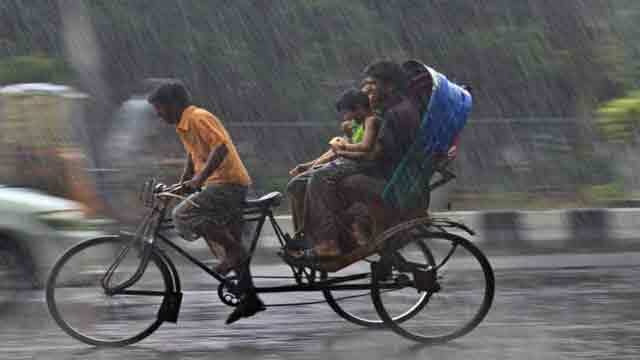 Met office recorded around eight millimeters of rainfall in three hours in the morning from 6:00 am to 9:00 am, said meteorologist AKM Nazmul Haque. The rain will continue to fall throughout Sunday in the capital and other parts of the country due to the depression, Nazmul added. Commuters, mainly the office and school goers are suffering much for the rain. Meanwhile, the maritime ports of Chittagong, Cox's Bazar, Mongla and Payra have been advised to keep hoist distant cautionary signal No. 3 while all the river ports have been asked to hoist signal No. 1. All fishing boats and trawlers over the North Bay and deep sea have been advised to proceed with caution.